Innovation Box guides you from from framing a problem to validating a solution on a small scale. The four-step process is based on innovation knowledge from business people, designers, educators, and entrepreneurs. So many problems, but no idea how to start? The challenges we face in schools and classrooms can seem daunting at times. After years of working with schools on turn around projects and teams of educators on problems as seemingly intractable as the achievement gap and 9th grade algebra failure rates, we have identified a four-step process that guides individuals or teams of educators from problem to scalable solution. Frame a clear and manageable problem. Test the solution in the field with students. Innovation Box includes everything you need to follow this six step process. Fuel - coffee card and chocolate bar. Seed money - you decide how much, but $100-1000. Tools - post-its, notebooks, sharpies, pens. Guide - a 92-page guide with 25+ innovation methods. Think outside the box with a box. A Step-by-step process to go from a problem to scalable solution. Learn how to accelerate educator solutions by following a checklist and engaging a network of passionate problem-solvers. Work with our team to implement a solution that works best for your school. You can launch an innovation incubator, convene a cohort of educators working on innovative ideas, or hold a series of innovation workshops to build capacity. Provide your educators with the tools used by successful problem-solvers to validate their own solutions on a small scale. More importantly, trust them and invest in them. 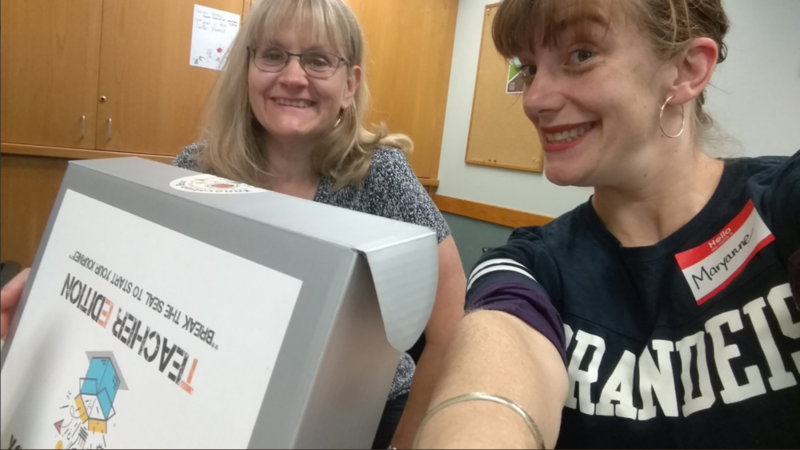 Using Innovation Box sends a strong message that educators are valued and trusted to drive change.